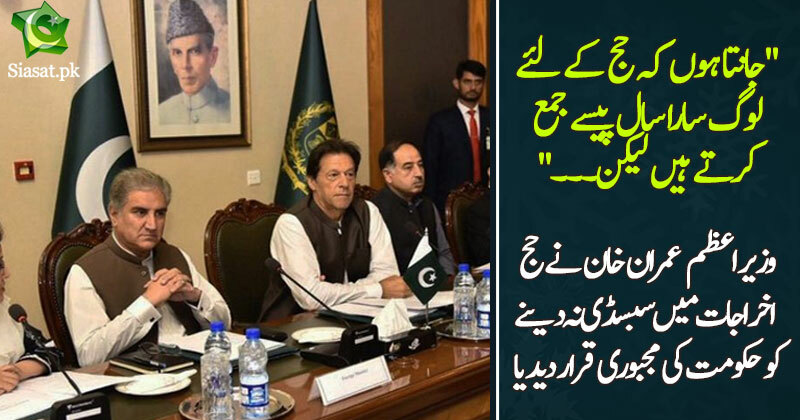 ISLAMABAD: Prime Minister Imran Khan said on Tuesday that the Pakistan Tehreek-e-Insaf (PTI) led federal government withdrew Hajj subsidy under compulsion, which resulted in an increase in Hajj expenses, reported ARY News. “I know that people save money throughout the year to perform Hajj. The government had to hike Hajj expenses under compulsion,” sources quoted the premier as saying while speaking to lawmakers from Rawalpindi division, who called on him at the PM House in Islamabad. Defending the withdrawal of Hajj subsidy, he said the Hajj cost rose by 35 per cent in Saudi Arabia too. “The government has to pay Rs6 billion on loans everyday,” he said. The prime minister assured the lawmakers of providing funds for development projects in their constituencies but cautioned that the funds won’t be given to MNAs and MPAs in future after the local governments would be made functional. The government announced today to accept Hajj applications from February 25 to March 6 through 14 designated banks across the country. It is pertinent to mention here that the government withdrew subsidy on the pilgrimage, increasing the expenses by Rs 176,000 for each pilgrim whereas the overall pilgrimage amounted to Rs 456,000. What kind of a subsidized Hajj is it where government is under water and had to take massive loans to stave off bankruptcy??? Isn't it equal to performing Hajj on borrowed money, where you are paying interest as well??? Exactly, the government made absolutely the right decision, Hajj is obligatory on those who can afford it, not on those who cannot, so people who can’t afford, doesn’t need to do it. No need to be apologetic about it. Haj is a personal matter. Any way, selective subsidy whether it be Benazir card, insaf health card or Haj subsidy which only benefits few people is unfair. Any subsidy/benefactory measure should be for all population across the board. No one can be selective and fair at the same time. If you select few, there would be poorer and more deserving elsewhere. No one subsidy can cover all.